The ScareFest Expo’s Unique Wide Aisles Make a Huge & Comfortable Difference! 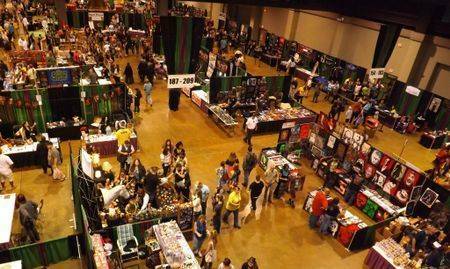 Be an Exhibitor with your Artwork or Business at the largest Independently Owned Celebrities, Horror & Halloween Expo in the U.S.! 2019 marks our 12th year! Find out what our long time vendors & Artists have know for 11 years running: The ScareFest is a great show to display your unique items! Add our Featured Vendor Option this year to get the most out of your ScareFest Selling Experience! Our fans are truly the best! Lovers of all things creative & mysterious! Starting with our 10th anniversary we have offered some NEW options for our Exhibitors! First: ALL Exhibitors & Artists are INVITED & WELCOMED to our Exclusive Friday Night VIP Party! No extra purchases needed! Second: We introduced our new option for our local & regional Artists! : Artist Tables! Lower priced/less space/table & chairs included. We are excited to welcome back all of our long time vendor & artist friends! Some of you have been with us since Day 1! We’ll see you there! •All of our 10×10 Vendor Booths come piped & draped with 1 skirted 8 foot wide table and 2 chairs. •Our Artist tables are specially priced to celebrate and encourage the Independent Artists that we know & love! NOTE: The actual floor plan layout has not been set for 2019. So the “mock-up” of accompanying the registration link is NOT ACCURATE. Your actual booth placement will be adjusted for the updated floor plan when it becomes available. Ready to apply? Need help? More Questions? Contact us at vendors@thescarefest.com.